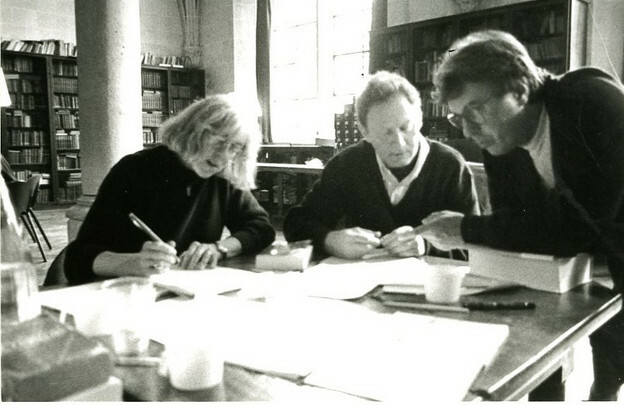 Rachel Blau DuPlessis, Emmanuel Hocquard, and Jean-Paul Auxeméry at work in 1992 at the Library at Royaumont. Photo by Kathy Imbert. In an interview from 2008, Rachel Blau DuPlessis discusses her serial poem Drafts and in particular “Draft 52: Midrash,” which takes up the ethical dilemmas the contemporary poet faces in writing about the Shoah. The poem attempts a sustained response to the challenge of Theodor W. Adorno’s famous statement that “to write poetry after Auschwitz is barbaric.” Though Adorno amended this claim repeatedly, his formulation prompted manifold critical and artistic responses as well as various misattributions contending that he claimed there could be no poetry after Auschwitz. This essay offers a reading of DuPlessis’s long poem “Draft 52: Midrash,” tracing its argumentative dialogues at the boundaries of the critical and the poetic. As an intertextual conversation with Theodor Adorno’s statement about the possibilities of poetry after the Shoah, “Draft 52: Midrash” institutes itself as a communicative and memorial space over and against an imagined elaboration of Adorno’s bases for an ethical interdiction of the poetic. The poem’s foregrounding of its own critical arguments contests any conventional acceptance of Adorno’s claim, asking that we reconsider the stakes of a space that conjoins commemoration of the victims of extraordinary violence and the reflection of our daily existence. His statement comes from the most wrenching revulsion, grief and human anguish. Therefore, because it was so absolutist, I respected it as such. However, because it was so absolutist (plus annihilating, as morally wrong or uncivilized, my desire to write poetry), I felt it had to be discussed. Not answered, discussed. Opened out. Exfoliated. Looked at again and again from any number of angles or facets. That is what my serial poem does. Each time I approach the statement, in the 27 sections of this poem, I try to honor the level of ethical revulsion and grief from which it came. So each of the sections tries to invent an answer to the question why did he say this in the immediate post-war context. What was he getting at by singling out poetry. By maintaining dialogue, “Draft 52: Midrash” becomes a way of “honor[ing] the level of ethical grief and revulsion” that Adorno’s words manifest. The poem offers commentary on his statement without seeking either to refute or to validate it, and at the same time, such commentary becomes a form of continuous self-examination and -questioning. By likening this process to an “exfoliation,” DuPlessis does not merely invoke renewal and regeneration: Instead, the dermatological/textual layers, removed to reveal the level below (and so the old made new), demonstrate the intertwining of body and writing in the intertextual enterprise, which operates at the point of contact between the material and the imagined trace. Indeed, DuPlessis emphasizes that her interest is not in “answering” Adorno but in inventing potential answers, in order to allow an ongoing confrontation between texts, so that the possibility of conversation beyond the hierarchical division of critical claim and poetic defense may emerge. At Draft 19, all of a sudden, it occurred to me, I could “begin again” — a Steinian move. By beginning again, I could construct a fold or crease across which the poems related. The fold involves any kind of connection between two specific Drafts, one of which I call “the donor draft.” What I’m trying to do is sustain a continuous, generative folding of one work over another. […] [T]he deep feelings of the fold, or its epistemology, are harder to articulate. I have the sense that with folding and repetition, all parts of the work are involved with all parts, each touches on all. There is a topology of mutuality, even mutual pleasure and relatedness. By establishing “donor drafts,” different poems become “muses” for each other. This avoids any “I/you” muses, with those well-worn gender ruts, and makes the pronominal interaction more like “she/it” in the poem as a whole. The flexibility of the draft — as ongoing work, which promises the possibilities of revision and adaptation — challenges the very concept of a boundary that preserves the perfected text. As DuPlessis points out, the notion of “relatedness,” of kinship and mutual influence between poems, involves the imaginative critique of the limits of formal and generic traditions. As much as I resist Romantic lyric or narrative, or make critiques of their normalizing and naturalizing of gender, of causality, of trajectory, of telos, of memory — my resistance is also porous. It is riddled by holes through which leak these discourses and their histories of use, their vast influences. My resistance itself is contained within a complex cultural netting in which the very histories of these genre(s) are constructed by the materials I would (claim to) resist and may want to appropriate. Destabilizing the position of authorial agency, the exchange of individual speech and collective discourse occurs through the permeable rather than rigid boundaries of structures, which cannot separate the internal and the external, since they both threaten and allow for appropriative movement. In DuPlessis’s view, the poet’s vexed position of simultaneously resisting cultural histories of influence and being infiltrated by them leads to the liberating movement of appropriation. Appropriation is not a usurping or fraudulent attempt but a form of dialogue that testifies to the ways in which the poet works within and against a tradition at the same time. It is a negotiation of cultural conditions and as such especially important for a feminist poetics: the notion of appropriation as practice enables the female poet to make visible the politics of ownership and even adaptation, processes from which she has heretofore been excluded. DuPlessis rejects the position of “woman in poetry,” for as she explains, woman can only occupy a central space as the object of a male view, not as the agent of her own making. Short poems — and particularly the lyric — preclude the woman writer from accessing the figure of the female, because she does not own her authorial position. I’m not trying to exclude “the lyric” from poetry, because that would be truly a quixotic gesture. I wanted to surround it, to build through it, and to rupture it — to break it up inside to become something else. I wanted to break a monochromatic subjectivity, a limit in tone, a smallness which builds one iconic object against the void and does not acknowledge the void inside the text. And I am also rejecting poems that are centered only in the private world, not a social and political world. This position was enabling for me. There are any number of other interlocking reasons: awe, grief, astonishment, the plethora, being overwhelmed. Then there is the whole area of cultural ambition, to open up into the largest kind of space, the challenge of scope itself. I just want to write a lot of women’s words right now because, basically, there are so many absent women in my generation, in generations past, and in all of culture. The vocabulary of forces that both move out of and move into the textual space — the trajectories of exclusion, enclosure, penetration, and rupture — make it impossible to determine from which side she approaches the framework, whether she speaks from within or outside its borders, from an individual position or on behalf of a collective. Indeed, even the phrase “I just want to write a lot of women’s words right now” contains an ambiguity, since we wonder whether “a lot of” modifies “women” or “words” (or both). This ambiguity proliferates potential implications: Does it designate the single author speaking for and to others in a quasi-prophetic mode (another form of expression traditionally denied women)? Does it conjure the scribe translating the inaudible into the audible, by archiving the silenced voices of the many for remembrance? Does it lay claim to a canonical, Whitmanian tradition, in which the self contains multitudes? In any event, this passage asserts a challenge to conceptions of both poetic and godly creation (and their assumed intersection in the figure of the divinely inspired male poet). In “opening up the largest kind of space,” the female poet reminds us that she works continuously to fill a vast, limitless universe with its missing texts, traditions, and genealogies. By flaunting appropriation as a productive act, DuPlessis questions what may link the restrictions on women’s poetry and on poetry after the Shoah, as she argues with their various explicitly and implicitly imposed limits and investigates the connections between gender, genre, and ethics. Appropriation allows for an agency that challenges assumed ethical norms: the female poet responding to the Shoah’s horrors speaks against a doubled circumscription of her speech. 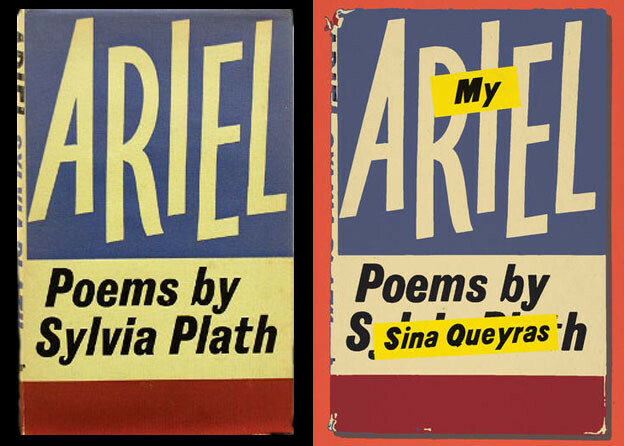 However, in this dual context, appropriation also foregrounds the problem of a necessary ethical boundary for the subject’s speaking position: If the poet gives voice to silenced others with whom she identifies, then she also calls into question the legitimacy of laying claim to the voices of those who can no longer speak themselves. “Draft 52: Midrash” puts into tension the appropriative movements of a feminist poetics and a poetics that deals with the Shoah, by asking again and again how one may counterbalance forces that confine poetic expression and delimit the position and voice of the speaking subject, while at the same time negotiating the competing claims of experience and imagination. The poem’s commitment to critical argument refuses categorical decisions on ethical quandaries, even as it seeks to provoke debate by emphasizing and utilizing the various conditions that bind the writing subject. Is “poetry” the only affirmative décor in this house? Kitsch collectible gathering dust on the shelf? Pearly button off a ripped shirt? that makes of “poem” a particular insult and blight? By beginning the stanza with a presumed citation that is at once an adaptation (through the substitution of “composing music” and “writing novels” for “writing poetry” after the Shoah), DuPlessis emphasizes the poem’s authority to take on another’s voice and to reimagine another’s speech. While we may understand this as a form of empowerment — the ability to oppose what seems a categorical statement by refashioning it from within — we remain aware at the same time that in the context of the Shoah, this use of another’s voice, more particularly the voice of one who can no longer respond, presents us with an ethical dilemma. Of course, speaking in a common language is already a form of borrowing another’s voice, as the intelligibility of language cannot be located in any particular speaking position but exists in circulating. Moreover, the quotation marks in this section may not only perform the borrowing of another individual’s voice (whose language is already collectively accessible) but may also serve to emphasize and critique the confines of genre, visualizing the boundaries that enclose what is considered a “poem.” Within this framed space, we find the poem authored by a woman poet doubly enclosed, so that the quotation marks imply what cannot be taken seriously, since it is supposed to remain in the private realm and to subsist as a single (rather than universal) articulation. Such critique operates at the intersection of the senses — or at the spot where their boundaries unravel — for while the quotation marks and their various implications stand out to the eye reading the poem, the listening ear must be attuned to a subtle difference in tone and intonation to set the cited word apart. Quotation marks are not the only restraining force at work here: poetry’s narcissism emerges only within parenthetical boundaries, from which it threatens, nevertheless, to explode. The parenthetical enclosure is contained a second time, now not only by syntax but by poetic form. The stanza’s final couplet (following as it does upon free verse) evokes the strictly prescribed style of the sonnet, which male poets use to describe a female muse or beloved, melding her body, as an object of visual and physical pleasure, with the aesthetic enjoyment derived from and epitomized in the poem. In this section of “Draft 52: Midrash,” however, the final verses appropriate the function of the sonnet couplet, utilizing its simultaneous effect of a surprising turn and satisfying closure. But such containment cannot hold, for the concluding question demands response, so that the final verses employ form as its own critique, revealing the impossibility of neat endings. Anticipating its self-liberation and performing its own poetic defense, the poem refutes the amassed clichés that proclaim its impropriety in dealing with matters of grave importance, of human experience, and especially of human suffering. Such considerations return us to the critical status of the fold, which possesses not only formal but also ethical significance. Recalling DuPlessis’s description of the fold as that which opens a space of “mutuality,” one may maintain that the fold establishes nonhierarchical relation without subsuming or eliding difference and so provides a way of conceptualizing the ethical bond, which proves vital to a sustained attempt at articulating loss. This articulation takes shape again and again as an exploration of deixis, demonstrating the intimate link but also the dangers of slippage between language and life. DuPlessis devotes a poem in her Drafts project to the problem of deixis, which describes the function of words whose meaning shifts depending on the context of their articulation. Indeed, “Draft 33: Deixis” is the very poem upon which “Draft 52: Midrash” folds, since the project instantiates nineteen as the periodic return. Taking issue with a scholar (Wlad Godzich) who claims that deixis marks the differences between locations, temporalities, and subjectivities, Draft 33 observes that “it appears oddly harsh, and also somewhat / automatic, drawing / such an unwavering line between the elements, / for in poetry, / the out-there is connected / precisely / to the over-here, / folded upon it / the ethics of poetry being that fold.” The fold thus both establishes and offers up for exploration that realm of poetry in which connection presents not organic wholeness but sustained involvement and its ethical consequences. Towards the end of Draft 33, DuPlessis asks, “What happens if there is something that takes place that cannot be pointed to” and asserts, “call this the matrix of the unallowable, or perhaps indifferently, say loss // call this the problem of the dead // call it the toll // It is the space of poetry.” Poetry exceeds a critical vocabulary by insisting on this deictic “it” both as origin and as remnant, as a surviving presence that proclaims its own fragmented nature. has become barbaric. Therefore, the poem: and so on. Or another. Words fail at the exact point of this. Poetry is made of words. Alt. : write a poem in which words fail. unsortable toll it must in this time silent fall? was poetry always now impossible? Exercising the various logical arguments that might motivate an interdiction of poetry — its inseparability from a condemnable culture, its failure in the moment of encounter with the reality of suffering — the stanzas retreat into the enclosure of the parenthetical and of the hovering, unanswerable question. The last verses dispense with logic as a mode of making sense of the world and avow only the negation of authorial agency. “Draft 52: Midrash” thus investigates the tension between the poem as documentary and aesthetic artifact on the one hand and the author’s efforts to produce it on the other. The aim to locate language’s breakdown — “Words fail at the exact point of this” — demonstrates the conflict between needing to insist upon the reality of suffering and being unable to articulate it. This unrelenting gesture towards the unnameable reality occurs by way of deixis, which, while defining a precise subject- or object-position, nevertheless resists delimitation, because it shifts its designation depending on the context in which it is used. The demonstrative “this” gestures towards the horror without being able to capture it in language. Since there are no question marks, the requests for response, merging into one another unpunctuated, become a litany whose differences in substance are overshadowed by the monotony of their parallel form. should it therefore be forbidden? And by whom, exactly? and how best? In the final line, the poem invokes Adorno as addressee, yet the reader cannot be certain whether the “you” designates only this single interlocutor or whether it doesn’t also demand of its audience their position on poetry’s interdiction. The stanza’s only rhyme, between “best” and “suggest,” performs (in a playful yet defiant tone) the threat of the “suggestion” as a verdict which imposes a formal framework, so that only a replication of similitude is possible. Thus, the section exposes such prohibition as a restriction of freedom (and, in this way, a form of violence), which reproduces what it seeks to avoid. By demanding in such varied ways why poetry should be the particular art form made impossible by the Shoah, DuPlessis implicitly holds Adorno accountable for delivering an explanation of what constitutes the poem and what, in this constitution, makes it uniquely unsuitable to post-Shoah existence. Moreover, she insists — frequently through a direct address of Adorno as her interlocutor, whose response she might expect — that he exhibit an awareness of the medium of his own reflections and of the fluidity of generic boundaries. Indeed, the undoing of generic limits operates not only through poetry’s use of the critical mode, but also vice versa. In the notes to the poem, DuPlessis explains that the conclusion of section 9 involves a quotation of her own writing, from “Draft 29: Intellectual Autobiography” (a title that itself hints at the importance of a poet’s critical self-reflection). The lines she cites from her earlier poem, embedded now in Draft 52, reveal a continued preoccupation with Adorno’s statement, whose words she portrays not as scholarly analysis but as a poetic discourse that casts its spell on her: “Still, ‘chortle under the stark curse / you entitle ‘Adorno’s verse.’’ / Because his statement, irreducible and bleak, / makes intricate play with rhetoric and metaphor, / enacting poetry against itself. So to speak.” The duality of radical minimalism and figurative proliferation is not an empty opposition, for the two are intertwined. DuPlessis’s rhyme on “irreducible and bleak” and “so to speak” suggests as much, hinting at language’s incapacity to capture and arrest experience. Ultimately, these lines indict “Adorno’s verse” of a potentially transgressive speech act, which founds the condition of its own speaking — “so to speak” read as “thus to speak” or “to speak in this way” — upon the self-destructive turning of poetry “against itself.” Of course, in doing so, his poetics must annihilate itself, since, if spoken on the basis of poetry’s self-obliterating movement, it can speak at all only in the process of being eradicated too. But because the speaker of Draft 52 insists at the same time on highlighting her own involvement and intervention — by foregrounding self-citation and self-reference — we also remain aware of the necessary distance between Adorno’s critical statement and “Adorno’s verse.” The former remains to haunt a discursive and poetic tradition, while the latter seems to obliterate itself: but what is their relation? What are the implications of the ways in which Adorno’s language survives and exerts influence on both critical and poetic traditions? revulsion, here’s the point — there is no accurate lexicon. Barring that “word,” half measures are indecent. Language not equal to itself. The only poem is blackened, barred-out lines. You need imagine the rest of this writing as black blocks. Dense with the imagined relations between physical and textual being, the stanza reflects upon and then seems to refute the transformation of body to letter (a doubt epitomized in the deictic “I”). Entangling the literal and figurative in its insistence that “here’s the point,” the stanza shows the movement of deixis and thus undercuts the colloquial ease and brevity of a phrase that claims to summarize and distill knowledge. The figurative notion of “barring the word” — that is, of excluding certain expressions, or verbal expression as such — evokes in turn a literal bar obstructing sight, a crossing-out of language, which is “not equal to itself” and thus cannot produce meaning through analogy. Yet the seeming assurance of this solution, which leads the speaker to advise the reader that “you need to imagine the rest of this writing as black blocks,” nevertheless begs the question why the poem does not instantiate this commandment itself, why, instead of recommencing as a literal barrier to sight, it mandates instead the necessary discrepancy between its continuation in words and the reader’s task to envision its obstruction. What happens to writing and to reading in this process, in this space in which the reader takes part in the poem’s making, or, in this case, in its dismantling? The stanza concludes that its injunction to “bar the word” is itself impossible, because imagining such an act would at the same time recall the Nazis’ erasure of writing, in the form of banned and burned books and — by the figurative extension that summons the horrific reality — of human beings. Personal pronouns are moot. Eye only. mounds — of faces, limbs, shoes, rags. The shadow line of times and places. By establishing the homophonic correspondence between the “I” and the “eye,” this section addresses the problem of whether only the person who has experienced atrocity may bear witness to it. (In this case, vision, as an immediate form of sense impression, stands in metonymically for experience.) If the stanza declares the authority of a speaking subject who was (and is) witness to the horrors (“I stared out,” “I am put in this place”), it also presents this authority as already mediated. Not only are these statements quotations — the borrowing, that is, of another’s voice — but the quotation “I am put in this place” hints at the very process of substitution, as the subject adopts the other’s position in an endlessly repeatable cycle. The phrase “I am put in this place” (and its imagined corollary “‘I’ is put in this place”) reveals deixis as the movement of substitution, in which the particular and the general circulate endlessly, and so it demonstrates the ways in which the pressures of language and body act upon one another. But it also locates the ethical dilemma at their nexus: if the language we use to describe the experiences proper to us is one that circulates freely, then where do we draw the line — the poem’s black bar — that prevents us from impinging upon the experiences and expressive capacities of another, of appropriating their lives into our versions of a common language? At the same time, we mediate the impulses of empathic recognition through shared words as well, so in this sense, their capacity to be adopted and reworked may serve a vital ethical function. The practice of putting the self in another’s place is thus interrupted by an obstruction of the I/eye, in the form of the thick black bar that invades the middle of the stanza. Is the bar at the center of the stanza also “the shadow line of times and places,” entering the poem by necessity, a visual reminder of the annihilation of words and, simultaneously, of the obliteration of vision as a tool for understanding? It appears to signal both the eradication of words and the impossibility of vision (in the double sense of sight and illumination). Interpreting this bar as an interruption of poetic creation or, alternatively, as its basis, the following verses present both possibilities: “Personal pronouns are moot. Eye only. / Poetry constructed of enormity: / mounds — of faces, limbs, shoes, rags. / The shadow line of times and places.” The movement of reduction and impoverishment (signaled by words such as “moot” and “only”) is countered by a growth that is only the accumulation of devastated fragments, the remnants of crimes committed: “mounds — of faces, limbs, shoes, rags.” In accordance with Marianne Hirsch’s concept of “postmemory” and Susan Gubar’s notion of “remembering what one never knew,” the temporal and spatial “shadow lines” also offer a “negative image” (photographically speaking) of the ways in which surviving humanity is haunted by the horrific suffering inflicted upon others, elsewhere, in the past. Of course, the poem also has a particular figure of simultaneous presence and absence in mind. In accordance with a poetics of questioning and of dialogic response, DuPlessis foregrounds the various invocations of Adorno as interlocutor, presenting him as apostrophized partner in argument. Here, apostrophe — both emphasizing and ignoring its status as posthumous address — demonstrates the ways in which dialogue seeks to endure, attending to the voice of another beyond the physical limits of his or her existence. One might argue that the poem, written decades after Adorno’s death, can only ask for his attention and participation in conversation by sustaining — and asking its readers to sustain — a disregard of the boundary between real and imagined time and between physical and remembered existence. Yet, as the section dedicated to Draft 52 in “Draft, Unnumbered: Précis” indicates, the traversal of this boundary is precisely necessary in order to engage in the task of remembering and commemorating others’ suffering: “If I were to cry out / the questions why or how or / who would hear us — / I’d say the only ones to hear this / are ourselves. / Therefore it is scrupulous to listen. / Especially to shadows.” Through enjambment, the questions about historical fact and meaning (why or how or who) become questions about the very possibility of communication (why or how or who would hear us). Thus, these verses reveal a tautological experience, in which the speaker and the listener are one and the same. But such enclosure does not relieve us of the twinned tasks of asking and listening; rather, its bond calls for our attention. Indeed, the synaesthesia of the final lines — the image of listening to shadows — instructs us not in a proliferation of sensory experiences but in the ethical demand entailed by the brutal curtailing of the senses. Shadows, as negative traces of the visible, stand in for the muted voice. To listen to shadows emphasizes the struggle involved in attending to an ephemeral yet tenacious reality, at a dual remove from our own sensory experience. being It would take a long time. If ever. to write poetry is barbaric, barbarous. The refusal of poetic production comes back persistently, a re-creative moment at odds with the temporality of the postexistence that it seems to express. As these verses make clear, the time of comprehending suffering and the time of mourning do not coincide. The simplicity and categorical absoluteness of Adorno’s verdict is deceptive, for it reemerges over and over as supplication and query, uncertain of an appropriate response and manifesting itself outside of its critical boundaries. If the apostrophized author cannot answer the poem’s challenges, his writing is nevertheless engaged in the intertextual argument the poem demands, an argument whose origin cannot be located within a defined framework but occurs at the very limits of the critical and the poetic. 1. Rachel Blau DuPlessis, “Draft 52: Midrash,” in Drafts: Drafts 39–57, Pledge, with Draft, Unnumbered: Précis (Cambridge, UK: Salt, 2004), 141–157. 2. Theodor W. Adorno, “Cultural Criticism and Society,” trans. Samuel Weber and Shierry Weber Nicholson, in Can One Live After Auschwitz? A Philosophical Reader, ed. Rolf Tiedemann, trans. Rodney Livingstone et al. (Stanford: Stanford University Press, 2003), 162. In German: “[N]ach Auschwitz ein Gedicht zu schreiben, ist barbarisch.” Adorno, “Kulturkritik und Gesellschaft,” in “Ob nach Auschwitz sich noch leben lasse”: Ein philosophisches Lesebuch, ed. Rolf Tiedemann (Frankfurt am Main: Suhrkamp, 1997), 205. 3. As Robert Kaufman points out, the scope and force of responses (initially in the German but later also in the Anglophone context) is surprising: “Adorno’s words have generated such controversy that it has seldom been remarked how bizarre it is — given how slim the chances initially would have seemed — that one barbed aphorism and its reformulations could come to have so much influence on, could create a six-decade donnée for, reflection on consummate horror and on art and culture’s ability — or incapacity — to address such horror humanely and critically.” See Kaufman, “Poetry’s Ethics? Theodor W. Adorno and Robert Duncan on Aesthetic Illusion and Sociopolitical Delusion,” New German Critique 33 (2006): 74. 4. DuPlessis and Adam Fieled, “Feature Poet Interview: Rachel Blau DuPlessis,” Adam Fieled: Poetry, December 2005–January 2006. 5. Describing the historical development of poetic responses to the Shoah, Susan Gubar mentions the notable presence of female voices in contemporary Anglo-American poetry. Often, she finds, these poets add supplementary materials to indicate their “indebtedness” to first-generation poets and to scholars. In DuPlessis’s case, I would argue that the critical apparatus and the supplementary materials she includes in her poetry function not simply to emphasize debt and gratitude but to enter a debate that extends beyond hierarchical or genealogical lineage to allow for and even promote argument across temporal and generic divides. Gubar, “The Long and the Short of Holocaust Verse,” New Literary History 35, no. 3 (2004): 457–58. 6. DuPlessis and Jeanne Heuving, “An Interview with Rachel Blau DuPlessis,” Contemporary Literature 45, no. 3 (2004): 404–05. DuPlessis also investigates the problem of the muse figure for a feminist poetics in “Marble Paper: Toward a Feminist ‘History of Poetry,’” Modern Language Quarterly 65, no. 1, 2004: 93–129. 7. See, for instance, DuPlessis, “Manifests,” Diacritics 26, nos. 3–4 (1996): 31–53, and “Poetry, Poetics, and Social Discourses,” Journal of Modern Literature 28, no. 4 (2005): v–viii. 9. DuPlessis and Heuving, 403. 12. DuPlessis, “Draft 33: Deixis,” Drafts 1–38, Toll (Middletown: Wesleyan University Press, 2001), 235. 13. At the same time, we may read the final stanza as performing a Talmudic logic of questioning by visualizing the entanglement of opposing voices left to stand next to one another in an unreconciled fashion, thus highlighting the indeterminacy of the intertextual. 14. In Poetry and the Fate of the Senses, Susan Stewart argues that “[d]eixis fuses form, expression, and theme as one event in place and time — the inseparability of frame and context in deictic forms is evident in the impossibility of paraphrasing or abstracting them. We therefore could not speak of the specificity of the deictic as translatable or transportable to other locations, for it is its own location. Yet we can understand its meaning or significance independent of its reference to the here and now of apprehension. The form creates or defines its location and the listener, viewer, or apprehender finds his or her position established in relation to the concrete determinants of the form — everything ‘matters’ as an aspect of the manifestation. In this way the artwork’s very specificity, its ‘finality of form,’ enables its context independence. The theory of deixis in linguistics has implications for presentational forms more generally, helping us consider framing the time and space of apprehension, the mutuality, reciprocity or nonreciprocity, of relations between positions and perspectives, the reversibility of things amid the unidirectionality of everyday time, and assumptions of intention and reception.” See Stewart, Poetry and the Fate of the Senses (Chicago: University of Chicago Press, 2000), 156. Stewart’s emphasis on the tension between fluidity and structure, particularity and universality in the deictic suggests its mediating function, while Agamben’s characterization of the deictic as a form of the “desubjectifying experience” implicit in all human existence and epitomized in the “barbaric” speech of glossolalia posits deixis as an indication of what cannot be mediated. See Giorgio Agamben, Remnants of Auschwitz: The Witness and the Archive, trans. Daniel Heller-Roazen (New York: Zone Books, 1999), 114–16. Both notions are productive currents for an analysis of the conflict between poetic excess and inadequacy, as we encounter it in DuPlessis’s work. 15. Once more, however, we may interpret this form as an allusion to the style of Talmudic exegetical practice, which launches its arguments with an inaugurating, quasi-rhetorical question. As Benjamin Harshav points out in his analysis of the ways in which the forms of Talmudic discourse enter the structure of Yiddish discourse — and by way of Yiddish, other languages Jewish authors use — it is vital to note that the question functions both as a solicitation or demand and as an expression of doubt: “[A]sking a question is equivalent to questioning, raising a difficult or problematic point in an argument.” See Harshav, The Meaning of Yiddish (Berkeley: University of California Press, 1990), 112. 16. DuPlessis, “Draft 29: Intellectual Autobiography,” Drafts 1–38: Toll, 179–86. 17. See, for instance, Marianne Hirsch’s description of the way in which a simultaneously excessive and insufficient relation to a past one did not experience structures the phenomenon of “postmemory:” “Postmemory is a powerful form of memory precisely because its connection to its object or source is mediated not through recollection but through an imaginative investment and creation. That is not to say that memory itself is unmediated, but that it is more directly connected to the past. Postmemory characterizes the experience of those who grow up dominated by narratives that preceded their birth, whose own belated stories are displaced by the stories of the previous generation, shaped by traumatic events that can be neither fully understood nor re-created.” Hirsch, “Past Lives: Postmemories in Exile,” Poetics Today 17, no. 4 (1996): 662. Susan Gubar claims that the value of poetry about the Shoah written by those who did not themselves experience it lies in the portrayal of this history’s lasting impact on contemporary cultural concerns, since “the proliferation of Holocaust poems in English turns our attention not away from those events but toward their reverberations as they affect a series of generations searching for a means to keep alive the urgency of continuing to confront a past as it passes out of personal recollection. The ‘warrant for imagination’ consists, then, in a psychological, ethical, and historical need to remember what one never knew.” Gubar, Poetry After Auschwitz: Remembering What One Never Knew (Bloomington: Indiana University Press, 2003), 9. But there are also those who argue that we are not haunted but exactly the opposite, since the Shoah has little or no impact on our daily lives. According to such interpretations, the “negative” quality of “the shadow lines” might highlight their waning, ephemeral, and weightless nature, as they are merely inversions of what we perceive as reality. Consider, for instance, Gary Weissman’s argument that contemporary commemorative practices which attempt to offer an “experiential” access to some aspect of the catastrophe hope to counteract “an encroaching sense that the Holocaust seems unreal or pseudoreal in American culture, which, in the aftermath of the event, fails to reflect in meaningful enough ways that the Holocaust occurred.” Weissman, Fantasies of Witnessing: Postwar Efforts to Experience the Holocaust (Ithaca: Cornell University Press, 2004), 22. 18. DuPlessis’s citation is taken from the following passage in Adorno’s essay: “I do not want to soften my statement that it is barbaric to continue to write poetry after Auschwitz; it expresses, negatively, the impulse that animates committed literature. […] But Hans Magnus Enzensberger’s rejoinder also remains true, namely, that literature must resist precisely this verdict, that is, be such that it does not surrender to cynicism merely by existing after Auschwitz. It is the situation of literature itself and not simply one’s relation to it that is paradoxical. The abundance of real suffering permits no forgetting […]. But that suffering — what Hegel called the awareness of affliction—also demands the continued existence of the very art it forbids; hardly anywhere else does suffering still find its own voice, a consolation that does not immediately betray it.” Adorno, “Commitment,” trans. Shierry Weber Nicholson, in Can One Live After Auschwitz? : A Philosophical Reader, 251–52. In German: “Den Satz, nach Auschwitz noch Lyrik zu schreiben, sei barbarisch, möchte ich nicht mildern; negativ ist darin der Impuls ausgesprochen, der die engagierte Dichtung beseelt. […] Aber wahr bleibt auch Enzensbergers Entgegnung, die Dichtung müsse eben diesem Verdikt standhalten, so also sein, daß sie nicht durch ihre bloße Existenz nach Auschwitz dem Zynismus sich überantworte. Ihre eigene Situation ist paradox, nicht erst, wie man sich zu ihr verhält. Das Übermaß an realem Leiden duldet kein Vergessen […]. Aber jenes Leiden, nach Hegels Wort das Bewußtsein von Nöten, erheischt auch die Fortdauer von Kunst, die es verbietet; kaum wo anders findet das Leiden noch seine eigene Stimme, den Trost, der es nicht sogleich verriete.” Adorno, “Engagement,” in “Ob nach Auschwitz noch sich leben lasse”: Ein philosophisches Lesebuch, 299–300.